Beer lovers and lovers of food that goes well with beer, take note: The Dock at Linden Street (95 Linden St., Oakland), the highly anticipated collaboration between James Syhabout (of Commis, Hawker Fare, and Box & Bells) and Linden Street Brewery’s Adam Lamoreaux, is ready to take off. Although final inspections won’t take place until later today, Syhabout told What the Fork that he’s confident that the restaurant and beer garden will be ready to open for business on Tuesday, June 3. Located next door to Linden Street Brewery, the project is divided into two parts: The Beer Shed — a super-casual beer garden with indoor and outdoor communal seating and a limited bar snacks menu — and The Dock, a 65-seat sit-down restaurant. As an added boon, there’s also a 70-car parking lot. 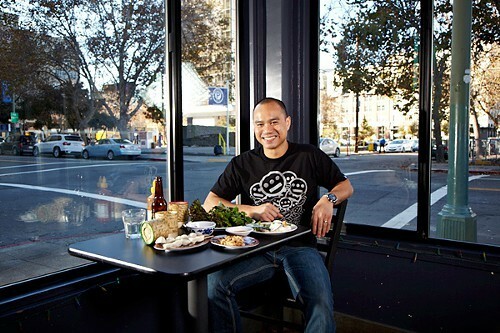 Syhabout likes for his restaurants to tell a story, and with The Dock, the location itself provided a compelling narrative: The building sits in a sparsely developed section of West Oakland that Syhabout calls the “new frontier,” facing out toward the train tracks and, beyond that, the Port of Oakland. “It’s a perfect place to watch a nice sunset and have a cold beer,” Syhabout said. According to Syhabout, in the 1890s the building served as a literal loading dock for the Westinghouse Electric Corporation, helping to power the entire East Bay. 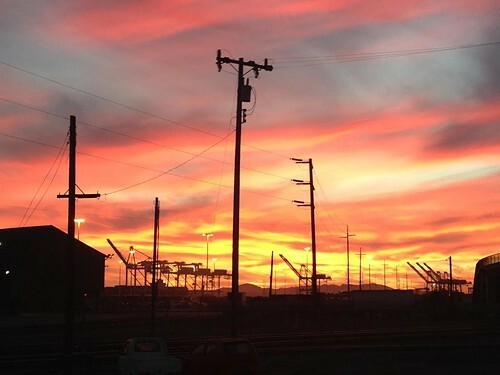 And the port — where to this day you see shipping containers that arrive from locations as far flung as Japan, South Africa, and Peru — is a perfect symbol of Oakland’s diversity. So, there will be jerk chicken wings; popcorn that tastes like Caesar salad; and pumpernickel-crusted onion rings served with sour cream, dill, and a caviar dip — a beer-friendly twist on a cocktail-party canape. There will be yakitori-style corn on the cob, served with miso, nori butter, and togarashi. Another dish will be a curry-braised chicken with lime pickle. Yet another is something Syhabout is calling a “falafel waffle” — chickpea batter that’s cooked in a waffle iron rather than fried, then served with merguez sausage, lebni (strained yogurt), and an herb salad. Syhabout has tapped Raiden Brenner, his sous chef at Box & Bells, to head up the kitchen at The Dock. But the restaurant’s initial, globally-inspired menu — is mostly Syhabout’s creation. Everything on that menu should cost less than $20 dollars, and all of the dishes are designed to be shared — there won’t be any traditional entrées. (“It’s a ‘non-trée’ restaurant,” Syhabout quipped.) Many of the dishes are meant be eaten with your fingers. Beer-wise, there will be ten taps — all local brews curated by Lamoreaux — and two seasonal cask beers that Lamoreaux will create in collaboration with the chef, with an eye toward pairing the beers with whatever ingredients are prominent on the menu at any given time of year. Christ Aivaliotis, the bar manager at Box & Bells, has created the cocktail program, which will feature well-thought-out beer-and-shot combinations ($8) and giant punch bowls ($40) that are big enough for four to six people to share. The Dock will be open Tuesday to Saturday, 5:30-9:30 p.m. The Beer Shed will be open every day — from 4:30 to 9:30 p.m. on weekdays, 11:30 a.m. to 9:30 p.m. on Saturdays, and 11:30 a.m. to 4:30 p.m. on Sundays.